Through the help of many friends and supporters we are able to help meet physical and spiritual needs of children and adults in need in Mexico. We work with kids in impoverished neighborhoods and orphanages. We share the love and the Word of Jesus with adults and children through our church plant in Tijuana and help them grow in a relationship with Jesus. It is an adventure following God. Joshua 1:3 "I will give you every place where you set your foot" ... In order to experience the passion we have we invite you to come with us for a day and see how your heart is touched by the people we meet. I only ask God to give us His words and His touch for everyone we come in contact with and to protect us until He is ready to take us to heaven. Romans 8:28 "And we know that all things work together for the good of those who love God and have been called according to His purpose." 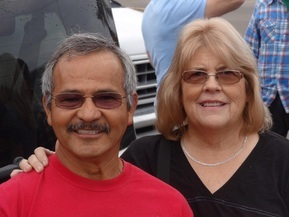 The Lord brought Jose Luis and Cindy together in ministry and then for life. Two are better than one, because they have a good return for their work .. (Ecclisiastes 4:9). Enjoy and keep in touch and keep praying! Prayer is the battle.